Popular press, essays, and summaries of research. If you're up for the original research see the Research page! Stephen Levine's nice essay on the practice of Noting is taken from his book Guided Meditations, Explorations and Healings. Noting is a silent acknowledgment in the heart of what is occurring in the mind. Noting simply states what is without the least intention to interfere. It encourages and openness to healing. It cultivates qualities of honest, non-judgmental awareness of the contents of consciousness, and an ongoing sense of presence in the present. It brings the practice from the meditation pillow into the world. It aids in generating a continuity of awareness. It keeps the mind in touch with the body. It is a direct recognition of the moment. The degree of a thought’s “power of attraction” to awareness is called “attachment.” Tens of thousands of mind-moments flash through awareness from instant to instant but only a few have the density and magnetic attraction to arise fully into consciousness as a thought. That magnetic propensity that originates from one’s personal (and inherited) history is a degree to which we have positive and negative attachments. A grasping or resistance that reacts to any object of awareness passing through. Noting attachment – noting “liking” and “disliking” from object to object – keeps us aware of “the chain of events.” Indeed there is a method of mindfulness that deals not only with watching sensations, and feelings against the silent backdrop of physical sensations, but is primarily focused on noting the liking and disliking that arises in the mind from moment to moment. Noting keeps awareness on track. It is recognition of the weather of the mind. It senses when there is an 80% chance of rain today or when the clouds are parting. It feels the first rays of the sun, as well as the first drop of rain. It is present in the present. It receives a snowflake in an open palm, not in a fist jammed deep within a lint-lined pocket. Noting becomes a gentle acknowledgment of the passing show. It recognizes and notes change as it occurs. It allows content to be seen within the larger context of process. And eventually process in the enormous context of being, the sacred emptiness of our essential nature, the boundary-less heart. Noting takes mediation “off the cushion” and into everyday lives. It is with us throughout our daily changes. It recognizes when we are moving towards or pulling away from the moment. It is with us when we drive, when we eat, when we work. It is like an old friend remind us to pay attention. Eventually, noting becomes a spontaneous response to changing states. Noting with a simple easiness the flow of consciousness. Not thinking about or analyzing this state in order to label it – not creating more thinking. If noting gets in the way, discard it. It is only a technique. When the mind is of itself on track and clear, noting may be “something extra” and leave a trace that is not useful. If noting sometimes feels to be more a hindrance than an ally, encouraging the analytical tendency rather than the simple presence – more work than clear play – drop it. As the practice of noting enters deeply and becomes one’s own, the words tend to fall away and just recognition of changing content maintains itself. The effort to become effortless has once again paid off. Then perhaps noting will only be employed for the heavy, more afflicting, states we recognize we sometimes become lost. Noting perhaps “fear” or “doubt” or “distrust” or “joy” so as not to be swept away by these more intense unfoldings. But generally just mindfulness notes what is, wordlessly, no longer a “labeler” or even a “watcher,” but instead, having entered directly into the process, the watching itself. I found this article in Mindful Magazine online bang on. I'm thinking a lot lately about focus and creating protected time for reading, writing, and creating. So easily out time is divided up by our attention skipping around. And we get so frustrated sometimes by "time management." Maybe we can't manage "time" but we can manage attention! I often read this essay in the day retreats for the Introduction to Mindfulness class. It was passed to me by someone and I haven't been able to find out much about Mr. Nussbaum beyond that he's a meditation teacher in Los Angeles (here's a profile page on him) but I do thank him for writing it - very helpful. You have permission to do the meditation practice you've been doing all along. You have permission to believe in it or question it or enjoy it or let it take you where it takes you. You have permission to be bored. How else will you ever get to the bottom of boredom? You have permission to try something else. You have permission to think. You have permission to worry. You have permission to wonder if you're doing it right. You have permission to go over German verbs. You have permission to think about the different grades of motor oil. You have permission to wonder, How is this meditation? You have permission to note body sensations. You have permission to do something else with body sensations. Love them. Be suspicious of them. Â Forbid them. Give them meaning. Question that meaning. You have permission to have feelings. You have permission to need someone, to worry out of habit, to fear vaguely, to feel disgust, to insist on getting things your way. Â You have permission to let things go on. You have permission to find yourself in unexpected mind states. You have permission to get lost. You have permission to be curious and interested. You have permission to get transfixed. You have permission to feel calm. You have permission to feel sleepy. You have permission to sleep. How else will you know about waking up if you don't have permission to be asleep? You have permission to know yourself in meditation. You have permission. You have permission. You have permission. I had walked into the exam room to listen to this patient; but my mind was a few steps behind, as I struggled with thoughts about the colleague who’d just snapped at me over the phone because she was in no mood to get another new consult, my mounting piles of unfinished paperwork, and the young patient with widespread cancer whom I’d seen earlier in the day. Thoughts about my new patient jumbled in the mix, too, but they came into focus only after I had pushed away the fears that I might have neglected to order a key test on my last patient, that I’d forgotten to call another patient and that I was already running behind schedule. That relentless inner conversation came to mind this past week when I read two studies on physician burnout and mindfulness in the current issue of The Annals of Family Medicine. Research over the last few years has revealed that unrelenting job pressures cause two-thirds of fully trained doctors to experience the emotional, mental and physical exhaustion characteristic of burnout. Health care workers who are burned out are at higher risk for substance abuse, lying, cheating and even suicide. They tend to make more errors and lose their sense of empathy for others. And they are more prone to leave clinical practice. Unfortunately, relatively little is known about treating burnout. But promising research points to mindfulness, the ability to be fully present and attentive in the moment, as a possible remedy. A few small studies indicate that mindfulness training courses can help doctors become more focused, more empathetic and less emotionally exhausted. But two important questions remain unanswered. How does mindfulness affect patients? And who really has the time to enroll in training courses that can take several weeks or longer? The studies in The Annals of Family Medicine attempt to answer those questions. In one study, researchers first assessed the baseline mindfulness of 45 doctors, nurses and physician assistants by asking them to respond to statements like, “I tend to walk quickly to where I am going without paying attention to what I experience along the way,” “I find myself listening to someone with one ear, doing something else at the same time,” and “I forget a person’s name almost as soon as I’ve been told it for the first time.” Then the investigators recorded the clinicians’ interactions with more than 400 patients and interviewed the patients to gauge their level of satisfaction. After analyzing the audio recordings and the patients’ responses, the researchers found that patients were more satisfied and more open with the more mindful clinicians. They also discovered that more mindful clinicians tended to be more upbeat during patient interactions, more focused on the conversation and more likely to make attempts to strengthen the relationship or ferret out details of the patient’s feelings. The less mindful clinicians, on the other hand, more frequently missed opportunities to be empathic and, in the most extreme cases, failed to pay attention at all, responding, for example, to a patient’s description of waking up in the middle of the night crying in pain with a question about a flu shot. Significantly, the most mindful doctors remained efficient. They accomplished just as much medically for their patients as their least mindful colleagues, despite all the extra conversation with patients about experiences and relationships. For many doctors, it’s not the lack of interest that prevents them from incorporating mindfulness into their clinical practices; it’s the time required to complete a standard training course. The courses require a significant commitment, ranging from a full week, to a full day once a week for eight weeks. In the second study, another group of investigators looked at the effects on 30 physicians of a mindfulness course that required only one weekend and two follow-up evening sessions a couple of weeks apart. Even after such an abbreviated course, the researchers found decreased levels of burnout, anxiety, depression and distress among the doctors. And nearly a year later, those salutary effects persisted, even without any mindfulness training “booster” sessions. Dr. Fortney and his colleagues filled the condensed course with techniques adapted for busy clinicians, like the “two feet one breath” technique in which a doctor, just before entering an exam room, stands in front of the door and concentrates on breathing and the feeling of his or her feet on the ground as a way to help focus on the moment. They also created a practical and accessible Web sitethat reinforces key points and offers helpful advice in the form of short videos, brief audio recordings and easy-to-digest tables. DECREASE FONT SIZEumans are selfish. It’s so easy to say. The same goes for so many assertions that follow. Greed is good. Altruism is an illusion. Cooperation is for suckers. Competition is natural, war inevitable. The bad in human nature is stronger than the good.These kinds of claims reflect age-old assumptions about emotion. For millennia, we have regarded the emotions as the fount of irrationality, baseness, and sin. The idea of the seven deadly sins takes our destructive passions for granted. Plato compared the human soul to a chariot: the intellect is the driver and the emotions are the horses. Life is a continual struggle to keep the emotions under control. Even compassion, the concern we feel for another being’s welfare, has been treated with downright derision. Kant saw it as a weak and misguided sentiment: “Such benevolence is called soft-heartedness and should not occur at all among human beings,” he said of compassion. Many question whether true compassion exists at allundefinedor whether it is inherently motivated by self-interest. Recent studies of compassion argue persuasively for a different take on human nature, one that rejects the preeminence of self-interest. These studies support a view of the emotions as rational, functional, and adaptiveundefineda view which has its origins in Darwin’s Expression of Emotion in Man and Animals. Compassion and benevolence, this research suggests, are an evolved part of human nature, rooted in our brain and biology, and ready to be cultivated for the greater good. First consider the recent study of the biological basis of compassion. If such a basis exists, we should be wired up, so to speak, to respond to others in need. Recent evidence supports this point convincingly. University of Wisconsin psychologist Jack Nitschke found in an experiment that when mothers looked at pictures of their babies, they not only reported feeling more compassionate love than when they saw other babies; they also demonstrated unique activity in a region of their brains associated with the positive emotions. Nitschke’s finding suggests that this region of the brain is attuned to the first objects of our compassionundefinedour offspring. But this compassionate instinct isn’t limited to parents’ brains. In a different set of studies, Joshua Greene and Jonathan Cohen of Princeton University found that when subjects contemplated harm being done to others, a similar network of regions in their brains lit up. Our children and victims of violenceundefinedtwo very different subjects, yet united by the similar neurological reactions they provoke. This consistency strongly suggests that compassion isn’t simply a fickle or irrational emotion, but rather an innate human response embedded into the folds of our brains. The brain, then, seems wired up to respond to others’ sufferingundefinedindeed, it makes us feel good when we can alleviate that suffering. But do other parts of the body also suggest a biological basis for compassion? It seems so. Take the loose association of glands, organs, and cardiovascular and respiratory systems known as the autonomic nervous system (ANS). The ANS plays a primary role in regulating our blood flow and breathing patterns for different kinds of actions. For example, when we feel threatened, our heart and breathing rates usually increase, preparing us either to confront or flee from the threatundefinedthe so-called “fight or flight” response. What is the ANS profile of compassion? As it turns out, when young children and adults feel compassion for others, this emotion is reflected in very real physiological changes: Their heart rate goes down from baseline levels, which prepares them not to fight or flee, but to approach and sooth. Then there’s oxytocin, a hormone that floats through the bloodstream. Research performed on the small, stocky rodents known as prairie voles indicates that oxytocin promotes long-term bonds and commitments, as well as the kind of nurturing behaviorundefinedlike care for offspringundefinedthat lies at the heart of compassion. It may account for that overwhelming feeling of warmth and connection we feel toward our offspring or loved ones. Indeed, breastfeeding and massages elevate oxytocin levels in the blood (as does eating chocolate). In some recent studies I’ve conducted, we have found that when people perform behaviors associated with compassionate loveundefinedwarm smiles, friendly hand gestures, affirmative forward leansundefinedtheir bodies produce more oxytocin. This suggests compassion may be self-perpetuating: Being compassionate causes a chemical reaction in the body that motivates us to be even more compassionate. Previous research has already documented the important functions of touch. Primates such as great apes spend hours a day grooming each other, even when there are no lice in their physical environment. They use grooming to resolve conflicts, to reward each other’s generosity, and to form alliances. Human skin has special receptors that transform patterns of tactile stimulationundefineda mother’s caress or a friend’s pat on the backundefinedinto indelible sensations as lasting as childhood smells. 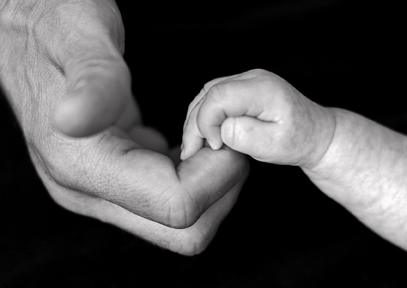 Certain touches can trigger the release of oxytocin, bringing feelings of warmth and pleasure. The handling of neglected rat pups can reverse the effects of their previous social isolation, going as far as enhancing their immune systems. My work set out to document, for the first time, whether compassion can be communicated via touch. Such a finding would have several important implications. It would show that we can communicate this positive emotion with nonverbal displays, whereas previous research has mostly documented the nonverbal expression of negative emotions such as anger and fear. This finding would also shed light on the social functions of compassionundefinedhow people might rely on touch to soothe, reward, and bond in daily life. Imagine yourself in this experiment. How do you suppose you might do? Remarkably, people in these experiments reliably identified compassion, as well as love and the other ten emotions, from the touches to their forearm. This strongly suggests that compassion is an evolved part of human natureundefinedsomething we’re universally capable of expressing and understanding. Feeling compassion is one thing; acting on it is another. We still must confront a vital question: Does compassion promote altruistic behavior? In an important line of research, Daniel Batson has made the persuasive case that it does. According to Batson, when we encounter people in need or distress, we often imagine what their experience is like. This is a great developmental milestoneundefinedto take the perspective of another. It is not only one of the most human of capacities; it is one of the most important aspects of our ability to make moral judgments and fulfill the social contract. When we take the other’s perspective, we feel an empathic state of concern and are motivated to address that person’s needs and enhance that person’s welfare, sometimes even at our own expense. In a compelling series of studies, Batson exposed participants to another’s suffering. He then had some participants imagine that person’s pain, but he allowed those participants to act in a self-serving fashionundefinedfor example, by leaving the experiment. Recent neuroscience studies suggest that positive emotions are less heritableundefinedthat is, less determined by our DNAundefinedthan the negative emotions. Other studies indicate that the brain structures involved in positive emotions like compassion are more “plastic”undefinedsubject to changes brought about by environmental input. So we might think about compassion as a biologically based skill or virtue, but not one that we either have or don’t have. Instead, it’s a trait that we can develop in an appropriate context. What might that context look like? For children, we are learning some answers. First, children securely attached to their parents, compared to insecurely attached children, tend to be sympathetic to their peers as early as age three and a half, according to the research of Everett Waters, Judith Wippman, and Alan Sroufe. In contrast, researchers Mary Main and Carol Georgefound that abusive parents who resort to physical violence have less empathetic children. Developmental psychologists have also been interested in comparing two specific parenting styles. Parents who rely on induction engage their children in reasoning when they have done harm, prompting their child to think about the consequences of their actions and how these actions have harmed others. Parents who rely on power assertion simply declare what is right and wrong, and resort more often to physical punishment or strong emotional responses of anger. Nancy Eisenberg,Richard Fabes, and Martin Hoffman have found that parents who use induction and reasoning raise children who are better adjusted and more likely to help their peers. This style of parenting seems to nurture the basic tools of compassion: an appreciation of others’ suffering and a desire to remedy that suffering. This wonderful article in The Chronicle of Higher Education on Dr. David Levy's work with students at UW gives some valuable information on attention, multi-tasking, and surviving our highly connected life. Before each class session, David Levy leads his students in a few minutes of meditation. Soon enough, though, a familiar craving bubbled up. For some people, the rabbit hole of Internet distraction begins with cat videos. For Ms. Hill, who calls herself "a massive weather geek," it starts with a compulsion to check conditions in outer space. But the assignment had her trapped. After a while, she says, staying on e-mail felt more natural. The e-mail drill was one of numerous mind-training exercises in a unique class designed to raise students' awareness about how they use their digital tools. Colleges have experimented with short-term social-mediablackouts in the past. But Ms. Hill's course, "Information and Contemplation," goes way further. Participants scrutinize their use of technology: how much time they spend with it, how it affects their emotions, how it fragments their attention. They watch videos of themselves multitasking and write guidelines for improving their habits. They also practice meditationundefinedduring classundefinedto sharpen their attention. 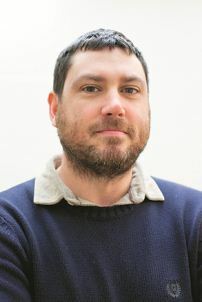 Their professor, David M. Levy, sees these techniques as the template for a grass-roots movement that could spur similar investigations on other campuses and beyond. Mr. Levy hopes to open a fresh window on the polarized cultural debate about Internet distraction and information abundance. At its extreme, that debate plays out in the writing of authors whom the critic Adam Gopnik has dubbed the Never-Betters and the Better-Nevers. Those camps duke it out over whether the Internet will unleash vast reservoirs of human potential (Clay Shirky) or destroy our capacity for concentration and contemplation (Nicholas Carr). On college campuses, meanwhile, educators struggle to manage what the Stanford University multitasking researcher Clifford Nass describes as a radical shift in the nature of attention. Mr. Nass, who lives in a freshman dormitory as a "dorm parent," sees that shift on students' screens. They write papers while toggling among YouTube and Facebook and Spotify. They text and talk on smartphones. They hang out in lounges where the TV is on. Amid this scampering attention, some fear for the future of long-form reading. That was a theme of a keynote speech at this year's conference of the American Historical Association by the group's departing president, William J. Cronon, a professor at the University of Wisconsin at Madison. Speaking to a ballroom of book-worshiping professors, the environmental historian expressed his anxiety about what he called "the Anna Kareninaproblem." Within 20 years, he wondered, will students manage to muster the dozens of hours of attention necessary to get through a lengthy novel like Tolstoy's 19th-century classic? If not, what does that mean for works of history that are even harder to read? A young man came up to him after a lecture he gave at another university. 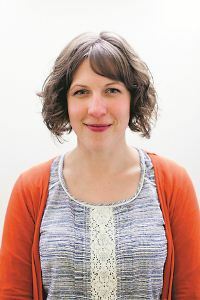 The talk had presented the themes of a 500- to 800-page book that Mr. Cronon is writing about the history of a small Wisconsin town, called Portage, from the glacier to the present. The young man told the historian how much he liked the lecture, but lamented that he could never read the book. Looking sad and ashamed, he said he had never read anything that lengthy. But Mr. Levy, a professor in the Information School at University of Washington, sees a problem with many discussions about what technology is doing to our minds. "So many of those debates fail to even acknowledge or realize that we can educate ourselves, even in the digital era, to be more attentive," he says. "What's crucial is education." The education of Mr. Levy's students begins with meditation: a short session at the start of every class. I visited his classroom one recent Thursday to watch the ritual unfold. Fourteen studentsundefinedtech-savvy people working toward information-related degreesundefinedjoin Mr. Levy at a series of desks arranged in a square. Shortly after 3:30 p.m., the professor removes his watch. He picks up a bowl-shaped bell. He pings the bell three times, slowly, with a short brown stick. Mr. Levy, 62, settles into a dignified stillness, honed over decades of practice. Each year he travels to Mexico and to Bellingham, Wash., for weeklong retreats where participants meditate in silence, morning to night. A practicing Jew, he also withdraws from technology for a weekly Sabbath, a period of staying offline that lasts from sundown Friday to sundown Saturday. If all this makes you picture a crunchy hippie, don't. With his slight smile and sad eyes, gentle voice and sensible sweater, Mr. Levy comes across more like a Manhattan psychiatrist. As the chimes from his bell fade, the classroom fills with silence. 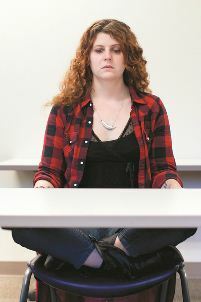 One student sits cross-legged with her palms facing up. Another rests her chin, prayerlike, on clasped hands. Another stares with a bemused expression. The only sounds come from outsideundefinedthe squawk of a bird, the bang of a door. "It seems so simple to just observe how you do e-mail or observe how you multitask between two things. But when you take a video of yourself doing it and then review it later, you notice all kinds of weird habits you have. We’re really unconscious when we use technology. This class is helping bring that consciousness backundefinedof just how zoned out I am." “When I come into that classroom, I have a lot of things on my mind. And often when I’ve been taught in the past, I wouldn’t be open to the ideas, because I was still stuck in my way of thinking before I got into class. Meditation gives you a reset button. I’m clearing my mind so I can give my full attention to what is going to be happening next." “It’s not that I’m not comfortable with technology. What I’ve discovered from this class, and carving out that time to really look at my habits, is that I feel like I can’t meet other people’s expectations of being timely." “Facebook, being back in grad school, it’s been a real issue. Because it’s such a distraction. But it’s also a place where my class has so much communication that I can’t miss it. So it’s not just how it affects our academics. It’s like, if I’m not engaging in this, am I not being as friendly to my classmates as I could be? Or not building as much of a relationship as I could be?" Those who happen to glance into this seminar, in Room 420 of Mary Gates Hall, might wonder whether the students had fallen asleep. Just the opposite: Meditation sharpens their focus. The practice, as Mr. Levy teaches it, involves repeatedly bringing your attention back to your breathing as the mind wanders away. Think of it like lifting weights. Just as you can build up your biceps by doing reps, he says, meditation can strengthen attention. There's nothing novel about this. As Mr. Levy has written, many cultures, over thousands of years, have developed techniques to still the mind and cultivate attention. Scientists like Jon Kabat-Zinn and technologists like Google's Chade-Meng Tan have brought meditation into medicine and business, and now Mr. Levy is doing likewise in education. His methods are secular but inspired by Buddhist tradition. Buddhism 101: Suffering is an inescapable part of life. You can avoid some of it. Much angst stems from failing to be aligned with the present moment, as the mind cycles through anxieties about past and future. Meditation trains the mind to focus on the present. Mr. Levy points out that other traditions besides Buddhism have reached similar conclusions. Ancient Greek schools of philosophy, for example, taught exercises designed to bring the student into fuller engagement with the present moment, according to Pierre Hadot, a French philosopher. At first some students find it weird to meditate beside their classmates. "I'm sitting next to this person," says Ms. Hill. "We can't say anything to each other. We just made awkward eye contact. What now?" It gets weirder. In addition to meditating at desks, students also practice walking meditation in the halls, which, as Ms. Hill jokes, probably appears to bystanders "a bit like the zombie apocalypse." But meditation works like an eraser that rubs out the mental chatter you carry up the stairs to class, says another student, Michael J. Conyers. "It opens me up to where now I can give my full attention to this guy." "This guy"undefinedMr. Levyundefinedis one of the more unusual characters thinking about education and technology. After attending New York's Stuyvesant High School and Dartmouth College, he earned a Ph.D. in computer science at Stanford in 1979, specializing in artificial intelligence. But AI's rational, computational vision of humanity felt limited. He dropped it and moved to London to study calligraphy and bookbinding. Mr. Levy eventually found a base to pursue his interests in old and new technologies: Xerox's Palo Alto Research Center. In the 1970s, the think tank had developed the first fully networked personal computer. As a researcher there in the 80s and 90s, Mr. Levy focused on the transition from paper to digital documents. But as digital tools gained momentum in the 90s, he started to wonder whether technologies sold as tools of connection were also disconnecting people from themselves and one another. Cellphones, e-mail, Internetundefinedall of it accelerated life. That contrasted with the stillness and focus Mr. Levy cultivated in meditation. How could people live balanced lives in the middle of these technologies? After Mr. Levy moved to University of Washington, in 2001, that was the question he took into the classroom. For his students, though, some of the most interesting results happen outside of class, as they use Mr. Levy's methods to analyze and change their often unconscious tech habits. On the second floor of Trabant, a coffee shop near campus, Ms. Hill pops open her MacBook Air to show me how the process works. She loves technology but would like to be better at setting boundaries, which is difficult in part because she's so busy. In addition to pursuing a double major in psychology and informatics, she interns for a consulting-and-marketing company and works as a teaching assistant. Her iPhone, almost an extension of her hand, constantly beckons. When she first got a smartphone, she and her friends would go out to lunch and sit there in silence, glued to their gadgets. "I started to realize that it was really making me sad," says Ms. Hill, who has short brown hair, a hoop-shaped nose ring, and a tendency to pantomime her thoughts with her hands as she speaks. "I was involved in all these cool social circles on Facebook, but it was so lonely. I would get all of my social energy out of a computer." She managed to dial down that Facebook addiction, but she remained an obsessive e-mail checkerundefineduntil Mr. Levy's class started to change her habits. It began with an assignment that required students to spend 15 minutes to half an hour each day observing and logging their e-mail behavior. The idea, an outgrowth of meditation, is to note what happens in the mind and body. Can they notice the initial impulse to check e-mail? What are they thinking and feeling at that point? What emotional reactions do they have the moment they set eyes on the inbox? How does their posture and breathing change as they e-mail? After observing their own behavior for a week, students write a two- to three-page reflection on what they saw. In the process, they tend to discover what works for them. They learn how strong their attention is at different times. They see how e-mail provokes pleasure, anxiety, even hatred. Ms. Hill was flabbergasted to find out how frequently she checked e-mail. She checked it right after waking up. She checked it riding the bus, crossing campus, climbing stairs, sitting in class, eating dinner. She checked it up to 25 times a day, just on her phone. For each new message, her phone vibrated. It stressed her out. Often the alerts concerned unimportant messages from e-mail lists. She was reacting to robots. Then came another assignment: "e-mail meditation." This meant concentrating only on e-mail for 15 minutes or so at a stretch. No answering the phone. No texting. No checking the weather in space. When the mind wandered, students were instructed to refocus their attention on the e-mail, just as they bring their attention back to the breath in traditional meditation. Each student wrote up personal e-mail guidelines. Ms. Hill realized that she hadn't been paying close enough attention to important messages as she tapped out one rapid-fire reply after another. She removed her university e-mail account from her phone, so it wouldn't tempt her, and started handling e-mail in batches several times a day. 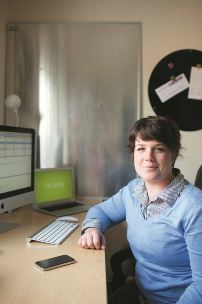 "For me, that type of hyperfocus really worked," she says of the e-mail meditation. "If I'm just constantly dipping out of my own life to go check my e-mail, and not giving my life or the e-mail full focus, it's almost like a waste of time." On her laptop, Ms. Hill opens up software called Camtasia to show me another behavior she's trying to improve: multitasking. Camtasia records what happens on her screen as Ms. Hill uses the computer. Meanwhile, hidden from view, it also deploys her Web cam to film her: her posture; her expression; and her physical environment, like the acoustic guitar and green couch visible over her shoulder. Mr. Levy's students use the software to record 15-minute multitasking sessions. It's the first of multiple exercises aimed at teaching them to multitask more mindfully, by noticing the desire to switch activities and deciding whether to follow it. When students play back the Camtasia recording, they see what was happening on their screens with their own faces displayed in a corner. They watch themselves flit among Words With Friends, e-mail, Words With Friends, Spotify, Words With Friends, and that goofy video of a cat rolling up against a sake bottle. Some are disturbed to observe that they got so distracted they forgot to work on the main task they had set out to accomplish, like reading an article. "Look at my faceundefinedI do not look happy," she says. "My posture is like this." She slouches her shoulders, aping what she sees in the video. The video shows her switching among e-mail, the Web, and PDFs. Three minutes in, her phone chirps. A new text message! "The emotional quality of what I'm doing on the computer screen is so, like, negative," she says. "And then what's happening on my cellphone screen is so incredibly positive. It's like this back-and-forth thing, almost like I'm switching rooms, you know?" In the recording, another text message interrupts her. And another. That happens four times over the 15-minute session. Ms. Hill sips her tea and giggles at the video. "I don't know how I get anything done," she says. All this breathing and self-observation may sound goofy, but Mr. Levy grounds it in science. Last year he and a team of colleagues reported the results of a National Science Foundation-backed experiment that combined meditation with multitasking. The subjects were human-resource managers. Some got meditation training, and others did not. They were then asked to complete tasks, such as scheduling a meeting, amid a barrage of interruptions from e-mail, instant messages, phone calls, and knocks on the door. The results: Those who had received meditation training were less fragmented in their work, switching tasks less frequently and spending more time on each one. They also showed less stress and better memory. The experiment was the latest in a growing pile of neuroscientific studies to find that meditation may improve emotional regulation and attention. Other research highlights the cognitive costs of not paying attention. Ulrich Mayr, a professor of psychology at the University of Oregon, studies multitasking. When Stanford convened a conference on that subject in 2009, he emphasized that "multitasking is actually rapid task switching, since the human brain does just one thing at a time." In a phone interview, I ask him to elaborate. Mr. Mayr offers the example of watching television while doing homework from a textbook. While you're trying to follow a story on television, you won't be doing your homework, he says, and while doing your homework, you won't get the TV story. Simple as that. What's more, he says, you pay a price for switchingundefinedwith moments of mental "dead time" unproductive for either task. For every activity, your brain must reconfigure itself to do a constellation of things required for the type of task. Keeping track of a TV show, for instance, involves activating brain areas that deal with visual inputs as well as consulting long-term memory to retrieve what you know about the characters. Want to switch to math problems? A different set of brain areas must come together. And writing the equations on paper for homework takes yet another set for motor output. All of that carries implications for teaching. The cost of classroom multitasking, he says, can be a failure to learn. Say a professor presents new concepts. To understand the ideas, students need to link them to things they already know, creating a network of associations that Mr. Mayr describes as "a rich knowledge structure." That happens only if they pay attention and think about the lesson. If a student listens to the professor with one ear while surfing Facebook, Mr. Mayr says, "I'm 100 percent certain that that critical process of creating new knowledge structures is not happening in the student's head." What's tricky is that someone who does surf the Web while listening to a lecture will very likely have the impression of doing just fine, Mr. Mayr says. That's because our minds lay a trap. All content in long-term memory is represented in two ways: "as a sense of familiarity on the one hand, and whether or not you truly understand it." People often mistake familiarity for understanding. They open the textbook after getting home from a lecture, and they recognize the material. They think: I get this. Then they take a testundefinedand bomb it. Another researcher, Mr. Nass, of Stanford, has found that people who chronically multitask are less able to focus and worse at managing working memory. They're also worse at switching between tasks. "The thing that one would assume is at the heart of multitasking, they're actually quite bad at," Mr. Nass says. "It shocked the hell out of me." Mr. Mayr, however, cautions against drawing the conclusion that multitasking weakens attention. If anything, he says, it's probably the opposite: People whose attention doesn't function well in the first place are probably most susceptible to the lure of distracting stimuli. The big questionundefinedwhether multitasking changes how our brains workundefinedremains unanswered, he says. That's because it's difficult to study. Ideally you would run a controlled experiment over several years, with one group of kids multitasking as usual and a control group of kids not exposed to those distractions. But it's basically impossible to create that control group. 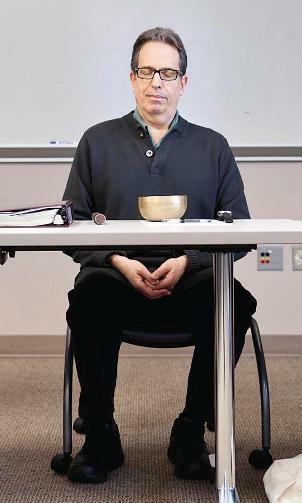 Mr. Levy, meanwhile, is encouraging other colleges to bring age-old contemplative practices to their wired campuses. (He isn't the only one: The Center for Contemplative Mind in Society, a nonprofit group, has for years supported such efforts in higher education.) He has visited other campuses, giving public lectures, running training workshops for faculty and staff, and meeting with students to discuss their online behavior. Back in his own class, Mr. Levy pings the bell once more to signal the end of meditation and the start of discussion. Students rub their eyes. They shift positions. One cracks his back. The students begin to debate a series of readings on multitasking. These include a feature in Scientific American Mind about the discovery of "Supertaskers"undefineda tiny sliver of humanity who multitask with easeundefinedas well as a report from that 2009 multitasking seminar at Stanford. The Stanford report strikes notes of urgency. Mr. Levy points his students to one section in particular: a plea for guidance to help the public handle its concerns about the effects of multitasking on education and family life. "I don't think that we have to just wait for the longitudinal studies in order to figure some stuff out," the professor tells the students. "What we're doing in this course is figuring some things out for ourselves." Walking into the lobby of Red Cedar Dharma Hall, you take off shoes and coat in the lobby and start to make a transition from whatever the busy circumstances were that enabled you to get to class on time. A few others are in the lobby, it’s been a few weeks and you remember some names. Saying hi quietly, perhaps asking someone to remind you of their name. A few smiles. Entering the classroom. It’s quiet and open. Bare wood floors. Some Buddha statues are at one end of the room but the focus is the circle of chairs and meditation cushions in the center of the room. People are sitting, some chatting quietly, others just resting in silence waiting for class to being. The instructor, Tim, pauses in the middle of his preparation, glances up with a warm smile to greet you and continues getting ready for class. Once everyone has gathered, class begins with some guided mindfulness practice. Gentle yoga standing in front of the chairs. Tim guides you through each moment and invites you to move slowly and feel the feeling in the body as muscles contract, joints bend, limbs lift and fall. You start to notice the feeling of the breathing in the body. Feel the shoulders relaxing a little. A sense of arriving. Arriving in the room, arriving in the body. Perhaps a persistent worry or memory comes into the mind. You follow the instruction to note that thought “worry about my daughter” and return the awareness back to the feeling in the body as Tim leads another gentle stretch. Then the class all sits down again for 15 minutes of seated mindfulness. Tim’s voice is right there inviting and encouraging you to feel the actual experience of the breath in the body in this posture. To invite the body to come more into stillness. To work with thoughts and emotions in a gentle, non-reactive way. To notice aches and pains as sensations in the body. To practice these skills of mindfulness – working with attention, awareness, and just being right here, right now a little more. Tim ends this second mindfulness practice with a bell. And you stretch a little in place. Look around. It feels a little more comfortable to greet your neighbor with a smile after doing these stretching and sitting practices side by side for this first half hour of class. You note the name on her name tag and try to remember it for later. She seems nice, an engineer you think she said in the introductions last week. A discussion follows about the experience you just had together. People report on how easily they get distracted. Someone notes a feeling in the body that she hadn’t felt so clearly before, a tension in her middle back, and wonders if it’s there all the time but she just doesn’t notice it. Tim invites her to describe it a little bit if she wants to and she says it’s a kind of pulsing or quivering sensation and wonders about it. The discussion moves on to the home practice that was assigned last week. One person shares that he was worried about whether he would have time to get to it but actually getting up a little earlier in the morning and spending that half hour using the practice CD has been really nice. His days have felt smoother, on a more even keel even though he woke up a little earlier than usual. Another person says, with a little embarrassment, that she only did the home practice once and wonders if the class is for her. Tim invites her to reflect on what her usual patterns are – is there a sense here of wanting to do the exercise perfectly and then when one day is missed does that bring up some paralyzing guilt? She says this might be true for her and she’ll just keep trying. Perhaps she shares something about the expectations she felt as a child. Then Tim hands out a poem, a beautiful piece about being in a field looking carefully at crickets and other natural things. This brings up a memory from your childhood but you decide not to share it just now. But there’s a feeling from the poem and the memory that wells up in the body. Tim talks about how thoughts so often steal the spotlight of attention away from our other senses. That sometimes the practice of mindfulness is a kind of “coming to our senses” – opening the eyes and ears and skin to the experience that’s happening now. That this can counter-balance those times when we are lost in thought and rumination. That the practice of mindfulness is a kind of remembering, a kind of returning to our life as it’s unfolding now. Then perhaps Tim brings up some other information about mindfulness. About the physical process of stress response and how linked together our thoughts, emotions, and bodily processes are. Perhaps he brings up a study about attention and happiness or recent science on how our brains change in response to how we use them. That there are positive changes in brain structure and function from meditation, or from being more socially connected or more compassionate. He marvels at how the ancient Buddhist “science” of meditation is lining up more and more with current science of neurology and psychology. A brief discussion follows and you have a sense of having something to chew on in the coming week. Perhaps you’ll do the optional reading about neuroscience if you have time tonight. Class closes with another mindfulness exercise. Perhaps Tim introduces walking meditation. Walking slowly. Feeling each step as the weight shifts, the foot rises, the foot touches the floor again. The breath comes and goes. Again the mind drifting off to thoughts and memories and worries but you find that the steady movement of the body in walking slowly helps you come back to the present. That something as ordinary as walking can have so many aspects and sensations and be helpful for reducing stress is a nice surprise. Before you leave Tim brings everyone’s attention to the class workbook and explains the home practice for the coming week. He offers some advice: “Be realistic, do your best, consider if it’s helpful to push a little against some of the habits around how you use time to make time for practice, or perhaps the work for you is more in the lines of relaxing about doing this perfectly, being gentle, letting it come when it does. Each of us is different.” You wonder a little at this extra instruction – it’s not just doing the home practice but also considering your attitude and approach. A lot to think about, but it makes sense. Back in the lobby and walking to your car the body feels lighter, the mind a little calmer. You wonder how long the feeling will last when you get back to your family at home or tomorrow morning in the rush to get to work. But it sure can’t hurt. People who meditate regularly say it provides mental, spiritual and physical benefits, including stress reduction and a sense of well- being. Even some mainstream doctors recommend meditation to help treat chronic pain, anxiety, high blood pressure and other ailments. How it works is not fully understood, though research is accumulatingundefinedand encouraging.Meditation helps you draw attention inward and calm the mind. It comes in many forms, which typically involve combinations of postures, breathing, sound, visualizations and/or movement. Subjecting meditation to scientific testing is a challenge. States of mind are hard to measure. And other forms of relaxation trainingundefinedfor instance, progressive muscle relaxation, biofeedback and stress managementundefinedmay be just as useful. Hot flashes: In a 2011 study in Menopause of 110 women going through menopause, those who participated in an eight-week mindfulness-based stress reduction program coped better with their hot flashes. Though the program didn’t significantly reduce the intensity of hot flashes, the women reported improved quality of life, better sleep and less anxiety and stress.Pain: Long-term practitioners of mindfulness meditation handle pain better, a 2010 study published in the journal Pain found. Anticipating more pain makes current pain worse; being attentive to the present helps prevent this. In an earlier study in the same journal, mindfulness meditation reduced pain and increased physical function in older people with chronic lower back pain.